The Lutz Children’s Museum was established to foster imagination, arouse curiosity, and promote museums as resources for life long learning. We strive to deliver high quality programming that stimulates the learner’s senses and promotes a love of learning. The museum’s work in education dates back to in 1953 when Hazel Lutz founded the Museum to provide educational resources to teachers, families, and schools. The Museum’s experienced educators now serves thousands of families from across the state and schools located in twenty-eight surrounding towns. Our mission is to provide engaging hands-on educational opportunities in the arts, science, and history. The Museum’s Art Programs provide a unique art-making experience in conjunction with art history, biography, geography, and life sciences. Our Art Programs utilize the Museum's vast natural history collection to bring artifacts and enrichment materials into the classroom to add context and meaning to the student's art project. This specific program provides various printmaking artifacts such as plates, tools and prints from multiple printmaking processes including woodcuts, etchings and screen prints. This program, like many of our programs, also brings a pettable live animal into the classroom. 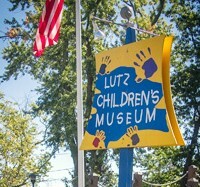 The Lutz Children’s Museum literally puts learning into the hands of children. Synthesizing art, history, and science for hands on education is a main component of our mission. Little Printmakers: Fun With Geometry! Total Execution Time: 2.2 sec.